A butterfly weed with solid orange flower clusters, it has a huge native distribution from Ontario to Newfoundland, New England south to Florida, west to Texas, and north through Colorado to Minnesota. It’s found in the eastern two-thirds of Texas, and is shorter than the common butterfly weed/milkweed carried in most nurseries. It needs well-drained soil and sun, and tolerates drought. Native. 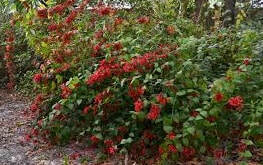 The branches of this 2’ – 3’ tall shrub grow outward in layers, with buds and flowers along each branch. The dark green leaves are cloven. It flowers off and on all year, and the little berry-like buds are just as charming as the powderpuff flowers. Dwarf fairy duster takes sun or light shade. Also called Hummingbird bush, Desert honeysuckle, Mexican flame and other names. In spite of its natural habitat from west and south-central Texas into adjacent northern Mexico, it grows well in Houston’s heavy soil. 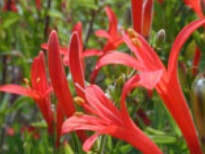 It’s a sprawling deciduous shrub with fiery orange, tubular flowers that attract hummingbirds. Rain triggers a new flush of blooms summer to fall. It can be clipped to the desired size and shape, including a low hedge. Native. 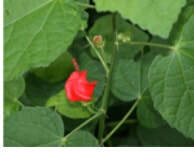 This plant’s name is almost as fun to say as Mellow Yellow Mallow. Try it. 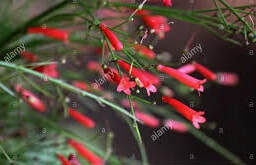 Former Chronicle garden writer Brenda Beust Smith (“The Lazy Gardener”) describes this russelia as having “a hardy-salvia-type growing habit with upright branches topped by showy stalks covered with fire-engine red flowers. It’s a major hummingbird/butterfly attractor in my yard. It’s not invasive. It just makes a lush plant four- to five-feet tall.” The leaves form a low clump while the flower spikes can reach eight feet, according to Joshua of Joshua’s Native Plants in The Heights. This is a big, upright lantana that’s native to Texas, Arizona, New Mexico and down into Mexico. Also called a calico bush, it produces yellow-to-orange blooms and grows in all kinds of soil as long as it’s not wet. It performs best in sun, and is a magnate for pollinators. Some people are very sensitive to the chemicals in the pungent leaves. Native.